Procedures to prepare Purchase Order. In this article, let us discuss about Purchase order in international trade. What is Purchase order? Who prepares purchase order? What is the importance of purchase order? 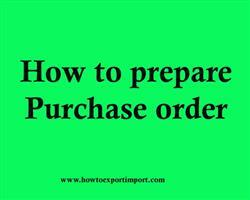 How is purchase order prepared? I have already discussed about dispatch of export samples and other steps to be taken to procure export order in other articles in same website. Now let me explain about purchase order. How does purchase order work? Once after approval of your sample by overseas buyer, the next step is on negotiation price of sale. You can quote your price of goods with all terms and conditions of sale. Once after approving each other on price of goods, terms of payment, terms of delivery and all other conditions on the sale, you send a ‘Pro forma Invoice’ to overseas buyer. Pro forma Invoice is nothing but a commitment of sale by seller to buyer with the terms and conditions of sale. Please note, the pro forma invoice is only a binding agreement but not a commercial Invoice. Based on pro forma invoice, buyer prepares ‘sale contract’ with complete terms and conditions of contract. Then the said contract is sent to you duly signed by your buyer. Once after receiving the contract of sale you sign and return back a copy to your buyer as a proof of acceptance of sale contract by you. Once after receiving the contract of sale by buyer, he places the order or arrange with his bank to open a Letter of Credit which ever agreed by both agreed. What are the contents of a purchase order? As I have explained above, purchase order is prepared on the basis of mutual agreement between buyer and seller. Some of the contents of purchase order are product specification, price, terms of delivery, terms of payment, mode of transport, validity of shipment etc. Since the seller has to supply his goods on the basis of purchase order, all terms and conditions to supply goods are mentioned in a purchase order. Since purchase order is prepared by buyer, obviously buyer signs a purchase order. However in most cases, buyer sends purchase order to seller and requests him to sign and sends back to buyer as a proof of acceptance of such purchase order. Can a purchase order be amended by buyer? Purchase order can be amended before effecting shipment, but with mutual understanding between buyer and seller. If any amendments on purchase order, a revised purchase order has to be sent to seller with such amendments. Should an export purchase order have buyer’s bank details? An export purchase order need not have buyer’s bank details. However, bank details of overseas buyer are ideal to mention in an export purchase order. Bank details of buyer help supplier at different levels of export process. If credit period is involved, buyer may approach an export credit guarantee agencies for insurance cover against such buyers on credit worthiness. In such cases, seller may require buyer’s bank details to apply with such credit guarantee insurance agencies for approval of buyer’s credit worthiness. The buyer’s bank details are to be mentioned in a bill of exchange to send to buyer for acceptance. For the purpose of sending shipping documents to buyer through his bank, the details of bankers of buyer are mandatory. I hope, I have explained about purchase order in simple language to understand easily. You can share your experience in handling export purchase order. Rajesh: On 05 February 2014 Very nicely described....Good luck! Murshid Mohamed : On 09 August 2016 I expect your advice and suggestion. I need to buy O-General AC, directly from the chennai sea port or any other port in southern India. How i can approach them? How i can buy? How to get the details? Did you have any contact point to get this information? Atul Dusane : On 20 November 2016 Thank you very much for your blog about "How to Export Import". I am new in the field of export and Import. I use to refer your site for my every doubt and queries.Its very helpful for new entrepreneurs like me.I want to know that where we can get the sample Pro-forma Invoice, Commercial Invoice, Purchase Order and any other related documents related to export import business .Thanks a lot again for your wonderful initiative to share your great ideas, thoughts and knowledge for young entrepreneurs.